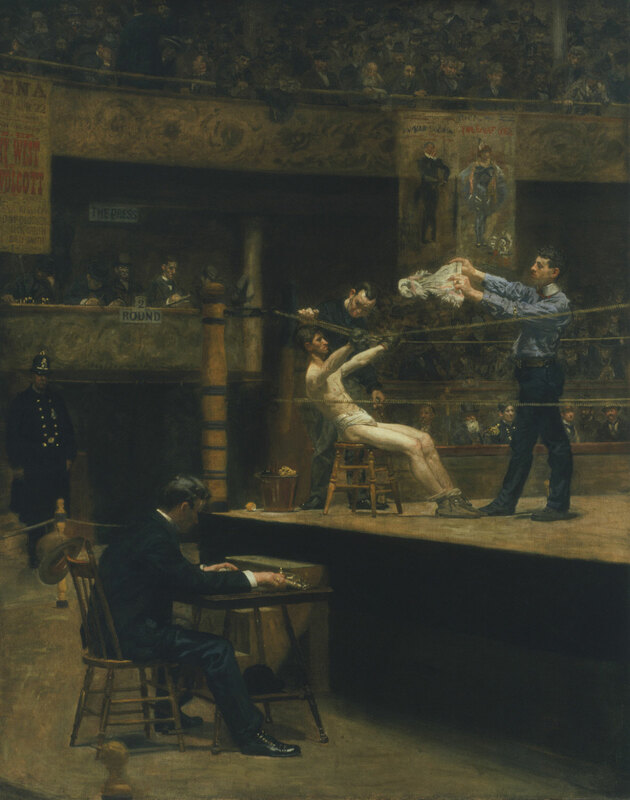 Most of Eakins's paintings after 1886 were portraits, but he returned to sporting subjects in the late 1890s with a series that he began after attending professional boxing matches at the Philadelphia Arena (then located at the intersection of Broad and Cherry Streets, diagonally across from the Pennsylvania Academy of the Fine Arts). The resulting canvases were as revolutionary in their subject matter as his rowing scenes had been more than two decades earlier. Eakins fastidiously planned Between Rounds. Susan Macdowell Eakins later recalled, "In Between Rounds every person in [the] picture posed for him. The interior was the Hall used by the fighters." Although the painting does not depict a specific bout, Eakins combined details from several to give it verisimilitude and worked diligently to capture the atmospheric effects of dust and smoke in the arena.